This pretty posy will be delivered to Kwinana today from our local florist to celebrate the birth of a baby girl! This bright, cheery box arrangement of gerberas was delivered today as a birthday gift to Kwinana. Big beautiful long stem roses just $35 a bunch. It’s always exciting when a favourite flower comes back in to season. The blue Iris make a great contrasting flower in mixed bouquets. We have added a new Easter gift to our range. This lovely large basket arrangement comes with Easter Eggs and Hot Cross Buns. 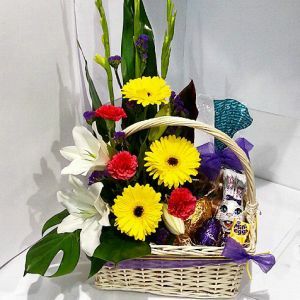 This Easter Basket would make a lovely Easter gift to be delivered to a family in the Rockingham, Kwinana, Spearwood area. For me, Autumn is a perfect time of year. With the cooler weather comes relief from the Summer heat and some new flowers come in to season. We are now stocking Iris, and within a month or so we will have Tulips. The change of season always inspires us to change the window display in our Rockingham flower shop. This year our window display is showing a rustic theme with contrasting textures of wood, glass and limestone. We have some new terrariums in stock with succulents in fishbowls and candy jars. We’ve just had a fun day planting up some new terrariums. We are loving the contrasting textures – the rustic brown succulents in the candy jars would look fantastic with any vintage or Victorian decor. Working on a pretty bouquet which will be delivered to Kwinana later today from our flower shop. We deliver to Kwinana, Kwinana Marketplace, Kwinana Town Centre, Medina, Leda, Parmelia and all surrounding suburbs. With fresh flowers, pot plants, teddy bears, balloons, chocolates, gift hampers, artificial flowers and more, we really do have something for everybody when looking for flowers and gifts in Kwinana. You can shop on our website, come in to our flower shop or call us on (08) 9527 5562 with your order. Hanging Basket Florist for flower artistry in Kwinana. A vase full of beautiful WA grown King Protea. Some of these protea are destined for use in a creative modern flower arrangement which will be delivered to Kwinana Marketplace today. These are the largest blooms in the flower shop. Originally from South Africa they are closely related to Australia’s native banksia so grow very well in our climate.